Starlab is a portable planetarium. When unpacked and inflated, Starlab transforms into a 16-foot dome that accommodates up to 30 students, and is handicapped accessible. A projector and subject cylinders introduce participants to astronomical topics through exciting graphics projected on the dome’s interior. All that is needed is floor space, an electrical outlet, and enthusiastic sky-gazers. 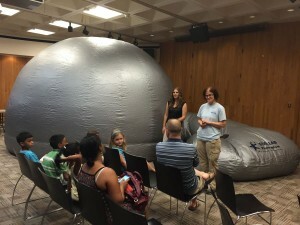 Starlab is great for schools, libraries, and other public organizations. Do you think in 3-D? Basic concepts in astronomy can be difficult to grasp because they require imagining the solar system in 3 dimensions, and from different perspectives. Capital Region BOCES is now partnering with Dudley Observatory to provide interactive planetarium programs where students explore the orbital motions that cause predictable patterns in the phases of the moon, seasons, and the changing positions of constellations in our night sky. For example, a first-grade student might predict where the sun and moon appear to rise and set, while a fifth-grade student observes and records the sun’s seasonal path through the sky. If your school is a member of BOCES, you may be eligible for aid. Please contact the Capital Region BOCES at 518-464-3999 or Laura.Lehtonen@neric.org for more information. Basic details: Cleared floor space, 20 x 20 ft with a ceiling height of 11 ft and access to a power outlet. Our astronomy educators require 45 minutes for set-up before the first program.